In an effort to offset the cost of labor required to repackage less than case quantity orders that are under $45.00 there will be a $5.75 Service Charge. This charge will be in addition to the cost to ship and any additional fees that may be associated with your order. This will appear on your order/invoice as a line item denoted as: RPS – Repacking Service. As of September 8, 2014, IMPAK has updated its "Freight On Customer Account" policy for UPS shipments. We can accept prepaid UPS labels provided via fax to 323-389-2200 or email to orders@sorbentsystems.com - we do not ship using Customer UPS Account information. Thank your for your understanding during this transition. Online orders generally take 3-5 business days to process from date of credit card confirmation. To expedite your order processing time, select "same day service" for a $25 rush fee. Please note: Order processing time is separate from shipping time; paying for "overnight shipping" does not guarantee same day processing and shipment. You MUST separately select same day processing if you need your order expedited. Same day orders must be placed by 12pm PST. If you are placing an order over the phone please be advised that an additional $10.00 fee will be applied to your order. Please read our Will Call Guidelines before placing your order. Will call hours are: 8:30 AM - 4 PM. No "Will Call" orders will be processed before 8:30 AM or after 4 PM. Please prepay your order by credit card before you get here to speed up your process. Please give us advance notice and arrange your Will Call pickup with your sales rep. You will receive an email notification when your order is ready for pick up. Walk-in will call orders are subject to a $25 rush fee for same day processing and pick up. If you have any questions, you can contact order processing at iso@sorbentsystems.com. Orders will have a 5:00 pm PST cutoff time. Orders for in-stock items are estimated to be shipped within 3-5 business days of credit card confirmation. We will contact you via phone or email if we anticipate a delay in your order. We do not ship on weekends or National holidays. IMPAK reserves the right to cancel your order if incorrect contact information is provided and we are unable to reach you. After freight approval, All international orders will be kept on a 48 hour hold for credit card verification with bank. After 48 hour hold, order will ship within 3- 5 business days. International orders are subject to a $35.00 wire transfer fee. All goods specified in the agreement are sold F.O.B. seller's plant, Los Angeles, CA. Seller shall arrange for transportation to Buyer at the address shown herein. Goods shall be shipped under a straight bill of lading naming buyer as consignee. The bill of lading shall be sent to Buyer at the address that accompanies this agreement. The risk of loss of the goods shall pass to Buyer as soon as the goods are delivered to the carrier. All orders will be shipped with no signature service required. If you would like signature service for your order, please indicate such when placing your order in the "notes and comments" section and we will add the additional $2.50 as required by the carrier. IMPORTANT: Alaska, Hawaii & Puerto Rico orders do not have complete shipping costs listed. We will email you with updated shipping costs based on your mailing address. Your card will not be charged additional costs without your authorization. You may be contacted by our customer service department to approve a freight cost difference due to weight, rural location, fuel surcharges, etc. The dollar figure provided will be the TOTAL; it will NOT be in addition to the computer generated charge that was provided upon online order. Seller warrants it has title to the goods and that they are not subject to a security interest, lien, or other encumbrance, except a security interest in favor of Seller for any unpaid balance of the purchase price stated herein. All sums due hereunder are payable in U.S. dollars via cash, cashier's check, wire transfer or other certified funds. The purchase price is payable without offset or deduction of any nature. Interest shall accrue on any unpaid balance due under this agreement at that rate of 1.5% per month. Any price quotation by Seller shall be binding only if made in writing and signed by Seller. All such quotation shall be valid only for 30 days from the time it is made by Seller, unless otherwise stated. A minimum charge of at least $25.00 will be applied to all rush orders. (Rush orders are always processed on a " best efforts" basis.) A rush order is any order processed and shipped in less than 72 business hrs. of placement. Seller's proposed delivery times are estimates only. Actual delivery and production times may vary and do not constitute a breach by Seller unless the delay is unreasonable. Production and delivery schedules shall be extended if technical or commercial issues remain unresolved, if any payment is not timely received by Seller in full, due to acts of God or forces of nature, or in the event of circumstances beyond the control of seller. Seller has no duty to commence any engineering, planning, or production until Buyer executes and returns this agreement and any preliminary payment is paid in full. All international shipments will require "prepaid duty fees". If you are not charged duty fees prior to shipment, in addition to a $25.00 processing fee, your credit card may be charged again for the balance IMPAK Corporation incurs from the shipping company. Your failure to pay the Duty (and other) Fees at the time of delivery will result in a demand for payment from IMPAK Corporation and we will charge your credit card for the fees and our services. In addition to standard freight charges, a minimum additional charge of $25.00 will be applied to all shipments where a chargeback is issued to IMPAK Corporation's freight account due to non-payment for orders shipped on Customer Accounts. Storage Fees will begin to accrue for product ordered and not shipped within one week after the customer is notified that product is ready to ship. The storage fee rate will be calculated according to the size of your order and you will be notified of the rate via customer service (e.g., $25.00/day per pallet). KNOW THIS POLICY BEFORE YOU PROVIDE PAYMENT. There is an automatic 10% cancellation fee (20% for custom built machines) once your payment has been received (credit card, check, money order, wire transfer, ACH payment, etc.) even if the cancellation takes place on the same day. Your order is not subject to cancellation without Seller's express written consent. Seller shall be entitled to collect payment for any work or expenses incurred as a condition to Seller's consent to any cancellation. Seller's goods are not subject to return without Seller's express written advance permission. Any approved returns are subject to a restocking charge to be determined by Seller of no less than 35% or $32.00 whichever is greater. Any freight, transportation, packing, loading, unloading costs related to returns are the responsibility of Buyer. In the event of a custom job/order cancellation (for any reason,) up to 75% of payments required to start the job may be retained. The total percentage retained is up to the sole discretion of IMPAK Corporation. In some "rush" job cases, payments made may start work immediately. Such action is secured by the payments received and even though work has begun the production "clock" or timeline does not officially start until all required documents are received. IMPAK does not guarantee any of its products compatibility with customer's application or use and handling of bags. It is up to the customer to do the necessary stability testing and purchase at their own discretion. In the event that an IMPAK Corporation product is mistakenly listed at an incorrect price, IMPAK Corporation reserves the right to refuse or cancel any orders placed for product listed at the incorrect price. IMPAK Corporation reserves the right to refuse or cancel any such orders whether or not the order has been confirmed and your credit card charged. If your credit card has already been charged for the purchase and your order is cancelled, IMPAK Corporation shall issue a credit to your credit card account in the amount of the incorrect price. IMPAK is unable to accept returns on any opened boxes of packaging products. No refunds, credits, or exchanges will be granted for opened boxes. This is in compliance with the health and safety regulations that IMPAK follows as a company serving food and bio-medical industries. **IMPAK offers packaging samples before purchase to help ensure that you order the correct packaging for your needs. **If you have purchased multiple cases and only opened 1, we can accept all but the opened package. Please read the following Terms and Conditions as not all products will qualify for return. All RMA’s are subject to review and will be issued an RMA number if these terms and conditions are met. Anything that does not meet this criterion will be automatically disapproved for return. Click on the link “RMA Form”. Save the form to your computer then fill out and submit via email to Custserv@sorbentsystems.com. Note: if you cannot save the download as a PDF, please fill out, print, scan and email to Custserv@sorbentsystems.com or Fax to 323-389-2200. The customer is responsible for checking the product label to be certain that the correct product was ordered. Buyer is liable for all shipping charges to and from our facility for repair or defective/damaged replacement. Claims of freight damaged or missing items must be made to the freight carrier (in accordance with U.S. law). We will be happy to assist you in making your claim. Returns of non-defective items must be made within 15 days after receiving the items, in its original packaging and in salable condition. A restocking fee of 35% or $32.00 whichever is greater, will be charged. Shipping related charges are not refundable. 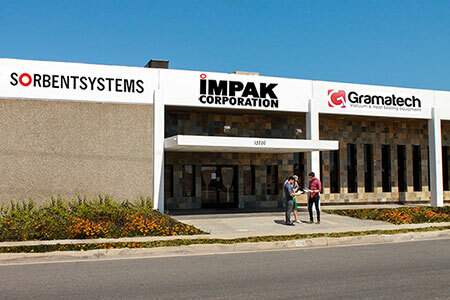 IMPAK Corporation does not accept returns for less-than-case quantity. Less-Than-Case quantity is defined as any amount less than the original amount of an unopened case. For instance, if a case comes prepackaged with 1,000 units, you cannot request a return for 300 units. Exceptions may apply for damaged or defective products, or in the event that the product was mis-shipped. When submitting an RMA for claims of defects or damage Customer must attach pictures depicting defect or damage in order for product to get an approval for return. Incomplete RMA forms will be automatically disapproved. Please fill out form completely and attach all necessary documentation to email. All RMA’s must be submitted to Custserv@sorbentsystems.com to be processed. When returning product please mark outside of packaging with RMA issued number in black marker for easy identification and processing. Any packages received without this number will be discarded/or put back into inventory. Any merchandise returned without a valid RMA will be subject to a $25.00 service fee. Credit card refunds will be processed via company check and made out to Card Holders name or charged back to the credit card. Any failure by IMPAK Corporation to enforce any of its rights under these Terms and Conditions or under applicable law shall not constitute a waiver of such rights. If any provision of the Terms and Conditions shall be deemed unlawful by a court of competent jurisdiction, or for any reason unenforceable, then that provision shall be deemed severed from these Terms and Conditions and shall not affect the validity and enforceability of any remaining provisions hereunder. These Terms and Conditions contain the entire agreement between you and IMPAK Corporation relating to your use of the Site, our Products, and Services. IMPAK Corporation may, at any time revise these Terms and Conditions by updating this posting. You are bound by any such revisions and should therefore periodically visit this page to review the then current Terms and Conditions. This Agreement shall be governed by and construed in accordance with the laws of the State of California. Should any action or proceeding be brought to enforce any of the terms of this Agreement, the prevailing party in said action or proceeding shall be entitled to recover its attorneys' fees and costs from the other party or parties in addition to any other relief to which it may be entitled. Jurisdiction for any such action or proceeding shall lie exclusively within the Superior Court of the State of California, County of Los Angeles. IMPAK reserves the right to refuse service to anyone at their own discretion.